Honda arrives on Man with 5 riders, 4 Japanese and one American. They bring along five 125cc racing motorcycles and four training bikes, plus enough spares and tools to set up a self sufficient workshop - a very professional approach. 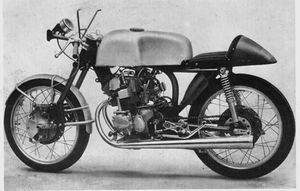 The racers, with the type designation RC142, have open spine frames, in which the engine is a stress bearing part, with leading link front and swing arm rear suspension. 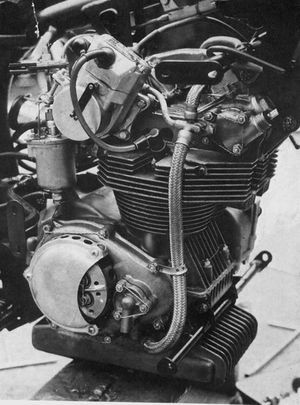 The engine is a four stroke twin with the cylinders slightly inclined forward under 6 degrees, with DOHC, driven by a vertical shaft with bevel gears on the left hand side of the engine, and from there with gears to the camshafts. There are two valves per cylinder, as can be clearly seen from the position of the spark plugs in the picture. When during practice it becomes clear that the bikes are lacking in power, four-valve heads are flown in from Japan. Bore and stroke are 44 x 41 mm for a capacity of 124.6 cc, and with a compression ratio of 10.5:1, 18.5 bhp is developed at 13,000 rpm; maximum rpm is 14,000. The valve angle is 40 degrees for the inlet valves and 44 degrees for the exhaust valves; spark plugs for the four-valve heads are 10 mm. Carburetion is by flat-slided Keihin carburetors with remote float chambers. Ignition is by magneto, driven by the inlet-camshaft. Lubrication is by wet-sump system, carrying 2 liters of oil. The gearbox contains 6 speeds, and the total weight of the bike is 87 kg. The wheelbase is 1265 mm. In the TT, the bikes finish 6th, 7th, 8th and 11th, earning Honda the team prize. The American rider drops his bike and doesn't finish. The race proved that the Honda's were reliable, but not yet fast enough, although the results no doubt would have been better if top European riders, well acquainted with the TT course, would have ridden the bikes. After the race, Honda's team returned to Japan, having spent on this one trip as much as most factories would spend on a whole season of racing. This page was last edited on 14 February 2019, at 22:38.